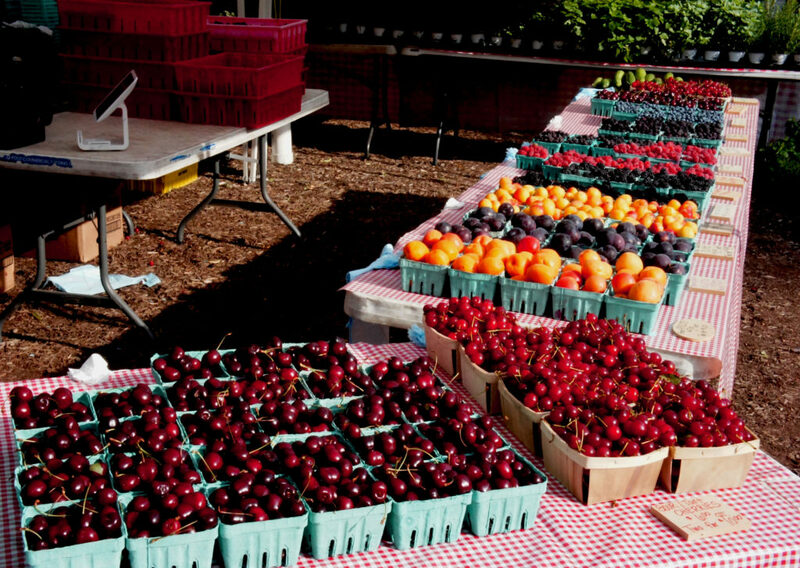 Chicago’s Green City Market is known as one of the nation’s premier farmers markets. After its founding in 1998 — in a downtown alley next to the Chicago Theater — Green City set a rule that only farms within a 250-mile radius of Chicago could sell there. By doing so, it helped accelerate the growth of a consumer market for locally produced food in the nation’s third most-populous city. The Market’s big annual public celebration is its Chef BBQ, which is coming up next week on Thursday, July 21. According to Melissa Flynn, Green City Market’s executive director, there will be 112 chefs participating, along with many of the region’s top beverage producers. The event — held at Green City Market’s outdoor space near the south end of Lincoln Park — is kind of a foodie fantasy camp. But there is also an important social mission. All proceeds go to Green City Market’s education and outreach programs that include matching funds for shoppers using food assistance dollars under Illinois’ LINK program, its Club Sprouts program for children, The Edible Gardens located nearby at Lincoln Park Zoo, its chef demonstrations and its composting program. To learn more about the Chef BBQ and to purchase tickets, click here. 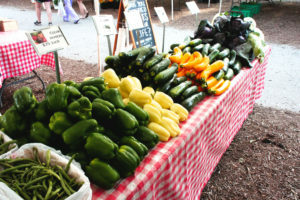 To learn more about Green City Market, click here. A photo essay from the 2015 Chef BBQ can be found here. Below is an excerpted interview with Flynn in which she discusses the market; the BBQ; her recent participation in a class taught by Alice Waters, the Berkeley, California chef and Good Food pioneer; how growing food can build community; and the overall zen of the farmers market experience. 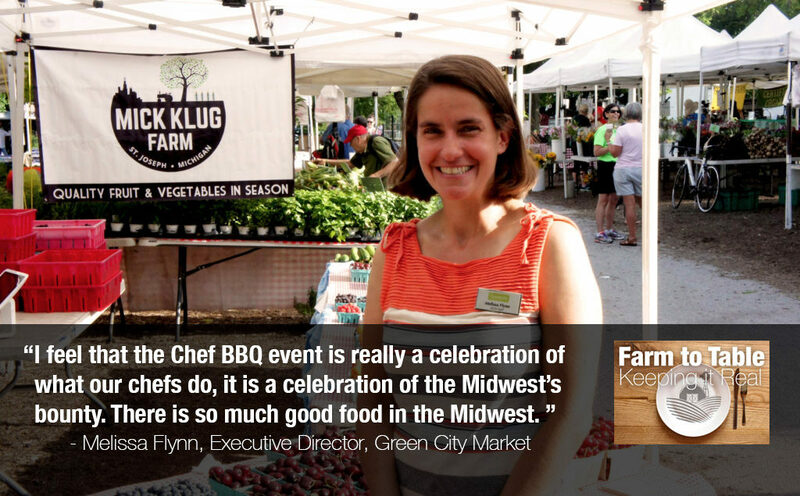 FamilyFarmed: The Chef BBQ is really symbolic of the role that Green City Market played in helping establish this local food movement in Chicago. Helen Cameron [of Chicago’s Uncommon Ground] says the turning point came when Green City Market started. 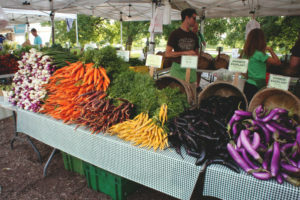 Melissa Flynn: Helen’s amazing… It’s chefs like her that have kept Green City Market going. When we first started in an alley, it was the chefs who supported the Market. It was the chefs who saw that this was making a difference in what they could put on the table for their customers, and it really just drove the movement and really created a demand for healthy food. I feel that it is really a celebration of what our chefs do, it is a celebration of the Midwest’s bounty. There is so much good food in the Midwest, and we will have 112 chefs showcasing the good food at the Market. FF: And also how many vendors? Flynn: We have between 55 and 60 vendors on a typical Saturday, and 38 to 40 vendors on a Wednesday. We grew a lot from six vendors back in the day. FF: In talking to chefs for this Farm to Table project, they say one of the biggest changes is that five years ago, 10 years ago, they were still foraging. Now, because the movement has advanced, even some of the broad-based distributors are carrying local farmer food because the demand for it is there. How is that affecting the farmers in the market, and why do the chefs who do come back keep coming back, even though they could just pick up a phone? Flynn: What I hear from the chefs is they like the experience. Chefs are so creative and they want the opportunity to come here and say, “I want that.” They have their typical shopping list, but then there’s also that one item that inspires them, this is going to be on the menu tonight. I think it’s sort of a muse for the chefs to see what’s in season and what they can create… I know some of the farmers will grow very specific things for the chefs. That relationship has them coming back from year to year. FF: Of course, this is a wonderful location. Flynn: It is lovely. We are so lucky to be in this park. It’s really a beautiful, warm, calming setting and people comment on that every week. I’ve had people come up to me and say this is their happy place, or something happened, they had a loss in their life, and if they could just get to Market they’d feel a little bit of peace. I cannot tell you how many people have said that to me, which is just such a privilege to be a part of. FF: One word that comes up over and over and over again is “relationships.” Obviously the face to face relationships they have here are so crucial. Flynn: Beth Eccles from Green Acres [Farm] will say she’s seen her clients’ kids grow up. She’ll remember when a couple was coming and shopping with no kids, just dating, and now they’re on their second or third kid. It’s pretty cool. Flynn: We have 128 spaces that are going to be filled with the best of the best of chefs, the best beverages you can possibly imagine, locally inspired ingredients. This is it. If you’re a foodie, this is your Olympics. Come join us. FF: And the best part of it is that, everybody let’s their hair down. You can go to any of their restaurants, but the likelihood that they’re going to come out and have a conversation with you is pretty slim. Flynn: Here you will be able to talk to Rick Bayless or Stephanie Izard or Paul Virant or Jason Hammel. They’re going to be here. FF: You mentioned LINK. That’s part of the purpose of the BBQ. Flynn: Absolutely. A portion of the money that is raised from the Chef BBQ goes to support our double-value program, which matches dollar for dollar in spending on your LINK card. We have people say, time after time, at the end of the month when the benefits run out that they wouldn’t be able to feed their family without this matching program. Alice Waters has said good food should not be a privilege, it should be a right. Access to healthy, good food changes your life. FF: Tell me a little about your experience visiting Alice Waters and her Edible Schoolyard. She is obviously a godmother of the Good Food movement. Flynn: It was absolutely amazing. It really was the most inspiring six days of the year. It gave me the sense of urgency and that there is so much more that we can do. And there is so much hope. All the negativity we hear on the news right now, to be with Alice Waters, who is on message and everyone should have food and here is how we should do it and it is not insurmountable. And then to be with other people for whom this is their passion and their drive, it was so inspiring. There’s a lot of good being done. FF: I visited Jen Rosenthal’s farm plot at 45th and Federal, and in our story yesterday, we noted the social significance of that, that was the site of the former Robert Taylor Homes, which was social policy gone bad. You have Growing Home, you have Growing Power. How do we increase the understanding of people that this a dynamic way of providing jobs and opportunity and hope for people? Flynn: When you teach people that they can be involved in providing for their most basic needs and then provide for others, it’s transformative. I was talking to a gentleman from Growing Power the other day and I said, “Did you ever think you would be a farmer?” He said, “No. When I thought of food, it came from a bag.” He was having so much fun with it. I was talking with a gentleman who is now one of the farm managers for Angelic Organics Learning Center. The farm they have is in the Rockford housing project. He said, “This was not the trajectory of my life.” Things were going really badly. It saved him and changed him, and now he says the greatest thrill he has is that there are people looking up to him. He never had that. FF: In just the two years that you’ve been the executive director, how has this changed your perspective on food and the connectedness that it creates? Flynn: I’ve always had a great respect for farmers, but now I have immeasurable respect for farmers. This is the toughest job in the world and so underappreciated and so crucial. It also creates that sense of urgency that we need to protect our food systems that I never really thought of before. Now, every day when I wake up, it’s “how can we improve access to food, how can we make sure farmers have a market.” Because I want to make sure my kids can eat healthy in 20 years. It really has created a sense of urgency in me. This entry was posted in Chef advocacy, Child nutrition and health, Direct Farm Marketing, Family Farms, Farm businesses, Farm to table dining, Farm to Table: Keeping It Real, Farmers markets, Food access, Food education, Good Food restaurant trends, Local Food, Regional food systems, Restaurants and Good Food, Small Farmers, Sustainable dining, Sustainable food retailing and tagged Alice Waters, Angelic Organics Learning Center, Chef Jason Hammel, Chicago farmers markets, farmers market double value programs, farmers markets, food assistance programs, Green Acres Farm Indiana, Green City Market, Green City Market Chef BBQ, Growing Home, Growing Power, LINK, Mick Klug Farm, Paul Virant, Rick Bayless, Smits Farm, Stephanie Izard, The Edible Schoolyard, Uncommon Ground. Bookmark the permalink.